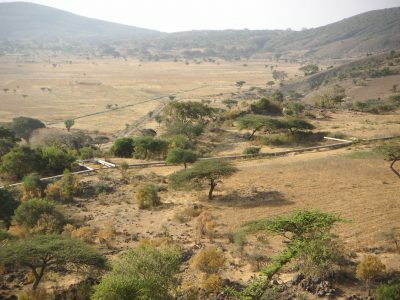 The great Rift Valley that runs through Ethiopia has played a pivotal role in human evolution. It is the location of the earliest fossils of ‘modern’ humans, was an important route for human migrations ‘out of Africa’, and is today home to more than ten million people. The Ethiopian Rift Valley has formed as the African continent has been slowing pulling apart for millions of years. As it extends and thins, this promotes the rise of magma from the depths, feeding one of the world’s most extensive volcanic fields at the surface. 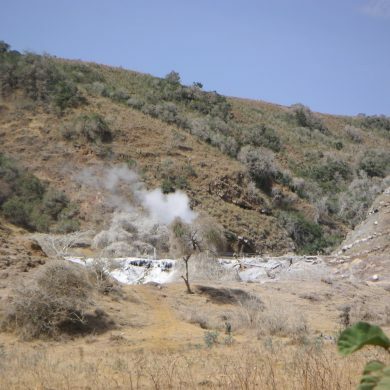 None of these volcanoes is thought to have erupted since the early 19th century; but several are now the focus of development of geothermal energy potential. In a new paper published in Nature Communications, Will Hutchison, a NERC-funded D.Phil. student in Oxford, and a team of international collaborators, shed new light on the violent pasts of several of these rift volcanoes. Using a combination of field work – to reconstruct the deep history of the volcanoes – and isotopic age dating, they find that at least 4 of the volcanoes of the main Ethiopian Rift suffered colossal eruptions between about 320,000 and 170,000 years ago. These were very significant eruptions that would have buried the rift floor in volcanic ejecta, disrupting water sources and habitats across wide areas; with the collapsed remnants of the volcanic edifices forming great ‘calderas’, or craters, in the rift floor. The pulse in volcanism coincides with the arrival of Homo sapiens in the region around 200,000 years ago, and begs the question of the extent to which these changes in the landscape and environments might have influenced human evolution and migration. Ongoing research in the NERC-funded ‘Riftvolc’ project is aimed at understand the scale of eruptions at other large volcanoes of the rift; their causes, consequences and future hazards. Side image: Several of the volcanoes considered in this study are also being drilled for geothermal power. The new observations will also be used to assess the likelihood of future eruptions and the risks posed to geothermal infrastructure and local communities that live in the shadow of these active volcanoes.